Regular readers will know of my love affair with Victorian Arcades. So, imagine the scene. I’m walking through Bristol’s lovely St James Arcade (previously known as The Arcade), connecting the Horsefair with Broadmead. With its high, vaulting, glass ceilings, it’s very beautiful, and I find myself bemoaning the fact that such a glorious arcade isn’t graced with a great coffee shop. And then, what should I come across, but The Crazy Fox? In fairness, Mark Taylor had given me the heads-up on twitter about The Crazy Fox and I’m sure I recall Girl in Bristol tweeting about it. However, they’d both said it was on Broadmead (which it is), and, for whatever reason, I’d not connected that with the Arcade. Hence my surprise. 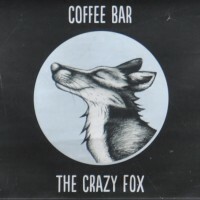 The Crazy Fox spreads over two floors, a bright and spacious spot with plenty of seating. As much as I like small Coffee Spots, it’s great to find a Bristol Coffee Spot with plenty of space that isn’t a Boston Tea Party. Serving a house-blend and single-origin on espresso, plus batch-brew filter, all from Bristol’s Roasted Rituals, The Crazy Fox also has Kokoa Collection hot chocolate, soft drinks, bottled beer/cider and wine, plus sandwiches, soup and cake. Bristol’s pedestrianised Broadmead is in the heart the city-centre shopping area, where high rents can often drive out independent, high-quality speciality coffee shops, making The Crazy Fox, which opened in October 2014, a welcome addition. My confusion about the location, by the way, arose because while The Crazy Fox has a window overlooking Broadmead, plus a neat row of tables on the pavement, it’s actually part of St James Arcade (both the address and the door are here, the door being first on the right coming from Broadmead, or last on the left, if, like me, you come down from Horsefair). The Crazy Fox runs along the arcade as it slopes upwards towards Horsefair. Tall windows line the arcade side, making the Crazy Fox bright and spacious, aided by high ceilings and a simple, white-painted interior. Downstairs, The Crazy Fox occupies what was probably once two units, the separate parts on slightly different levels. The main area, at the Broadmead end, is the lower one. You enter here, the counter against the opposite wall, running off to the right. The cake/food is directly ahead of you, the till/coffee on the right. The three-group La Marzocco Strada faces the front window, visible from Broadmead, so you can stand at the counter and watch your coffee being made. There are window-bars either side of the door, while to the left, there’s more seating: a four-person table and, against the back wall, a hexagonal table in the corner. Between them, three steps lead up to a comfortable lounge area at the Horsefair end. Another window overlooks the arcade, plus there’s a second door (which isn’t in use) up here. Another hexagonal corner-table, a small, two-person table, plus a couple of sofas/comfortable chairs provide the seating. However, that’s only the half of it. The counter conceals a staircase, which, starting opposite the hexagonal table, leads up and around to a large, upstairs lounge (the Foxes Den). This runs the full length of the two units with a mix of sofas, armchairs and conventional tables. While the ceiling is lower and the windows are smaller, it’s still bright and spacious. The walls (both upstairs and downstairs) are adorned with a variety of artworks, most of which is for sale, the artists on display changing on a monthly basis. The Crazy Fox has a decent food offering, with cake, soup and sandwiches. Since I was there for breakfast, I had the halloumi and mushroom breakfast muffin, toasted of course. This was lovely, the mushrooms and halloumi giving it plenty of flavour and texture. Having not come across Roasted Rituals prior to this trip, The Crazy Fox was one of three places serving its coffee that I visited on this trip (Playground Coffee and Tradewind Espresso being the other two). I passed on the batch-brew filter but tried the house-espresso (a blend of Ethiopian, Rwandan and Colombian) in a flat white with my breakfast and followed it up with the Rwandan single-origin as an espresso. My flat white, which was a pleasingly small 6oz, was very smooth and sweet, while the milk held its pattern all the way to the bottom of the cup. The espresso, which was well-made, was bright and fruity, but a little too bright for my palette at that time of the morning! If you liked this Coffee Spot, check out the rest of Bristol’s speciality coffee scene with the Coffee Spot Guide to Bristol. This entry was posted in Breakfast, Bristol, Cafes, Cake, Coffee Terraces, Evening Opening, Laptop Friendly, Lunch, Sandwiches, Victorian Arcades and tagged include by Brian Williams. Bookmark the permalink. Hurrah! It’s a welcome counterpoint to all the chain coffee shops in Broadmead. The Starbucks in Cabot Circus has a great view but it’s still a Starbucks. TCF used to be one of those Pasty Shops and the unit opposite was (another) Starbucks and has since been a florists and a clothes shop. Things don’t seem to stick very well in the arcade, apart from Shakeaway, so I hope they manage to change that. It is indeed a welcome addition and a good sign that speciality coffee is gaining footholds in more mainstream areas.